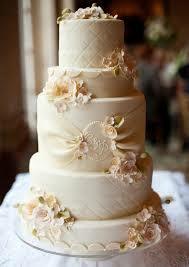 Everyone knows that the bride’s dress and the wedding cake are the two centrepieces of the wedding day. It’s just common knowledge. And most girls have an idealistic view, in their mind, of how everything on their big day MUST plan out- OR ELSE. 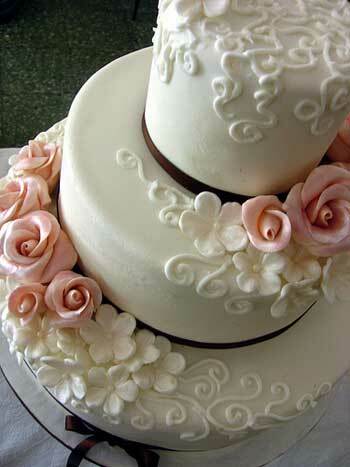 Living in a house of bakers, I know a little thing or two about classy wedding cakes and wedding cake recipes. I thought I’d share a little bit of my knowledge! 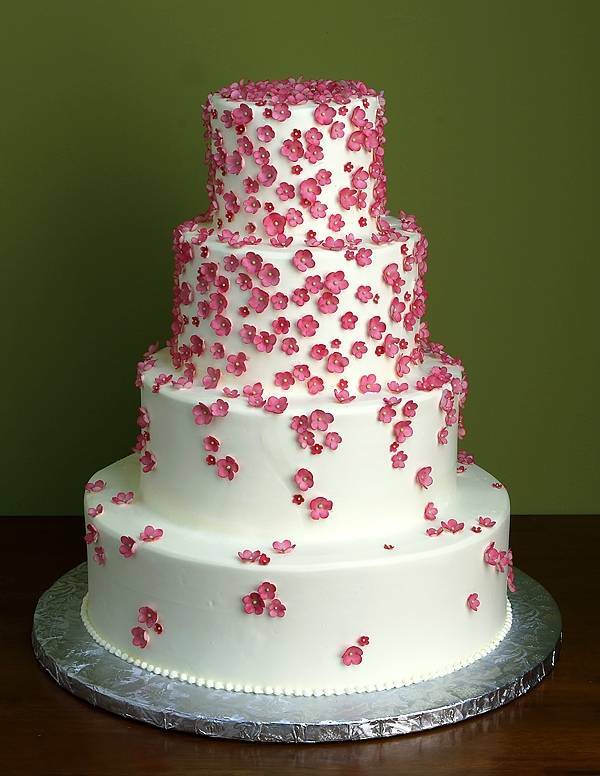 Here are my top five wedding cake concepts that are sure to fit every girl’s dream! Some people like plain wedding cakes (plain black and white), some people prefer vintage wedding cakes (lots of frills and pillars) and others prefer something more vibrant and personal (based on how or where they met, etc.). However, the style must be decided upon first, before making any drastic decisions about colors or design! A personal preference would be the Michelangelo approach, 3D sylphs and roses made from cova paste gracefully circling a glorious three-tier ivory cake. Nonetheless, it’s your day! You could have a cake made of cabbage-patch dolls if you liked! 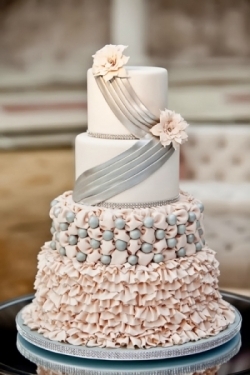 If it’s personal to you and adds sentimental value to your big day, then choose whatever makes you happy. It’s all well and good to have the cake looking divine on a big stand in the center of the room; however, when people eat it you need them to be somewhat impressed with your choice of ingredients! Traditionally, fruitcake is a popular first choice in Ireland but once again, I have to share my personal favorite and tell you that chocolate biscuit goes down a treat! A divine combination of chocolate, caramel and any biscuit of your choice. I really love this one because it’s different, not many people would have it. Plus, if you’re torn, you could always have a few dummy tiers, a chocolate biscuit tier and maybe add a little bit of your traditional routes and have a fruit cake tier as well! It doesn’t always have to be just one flavour! It’s important to remember that although you want the cake to be absolutely perfect in every respect and manner, you don’t have to sell your soul. There really are ways to dim the cost- isn’t that hard to believe? 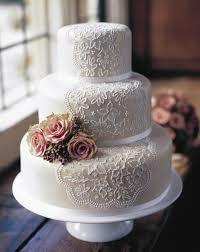 A lot of huge bakeries usually hire free-lance bakers and confectioners that would be really happy to take nixers. Do your research and agree to supply all ingredients & pay a decent price on top for the labor! I mean, it’ll still work out expensive but not as expensive as going through an actual bakery! Or, you could put on your cute face and flutter your eyelashes at a family member and ask for your wedding gift to be the cake. Cheeky? Slightly, but everybody loves a bit of cheek! I remember watching something on the television not so long ago that described a lady’s situation where she really didn’t want to do the whole huge-cake thing. Basically, it was a small wedding and she felt it was a waste of money because nobody really eats it or cares. And some people really do feel that way and in some ways, she’s right. I mean, it might just be me, but any wedding I’ve ever been to, most people are too full (or drunk) to eat the cake. So, why not create and design a selection of cupcakes instead? Have mini designs on each one and leave them as a display for the guests? Or you could do both! All I know is I really like this idea. I think it adds a little bit of personality! The approach you take in decorating your wedding cake is really important. Do you want figurines on the top? What kind of colors are you going to use? Would you like pillars? What about ribbons around each tier? What about pins and pearls? Have you even decided if flowers are going on it yet? Most people have a fair idea in their mind about what kind of cake they want, however, decided what you want and what goes where can knock off the balance of the cake. So, when you’re explaining your preferred style to your confectioner, use photographs as a reference point, just so there’s no confusion. S a y C h e e s e I n S t y l e! Enter your details below and one of our team will call you as soon as possible.